This image released by Paramount Pictures shows Anthony Hopkins as Sir Edmound Burton, and Hot Rod in a scene from, "Transformers: The Last Knight." The fifth film in the Transformers series, “The Last Knight,” opens with a mighty battle between King Arthur and his knights and the Saxon hordes. Vastly outnumbered, they need the magic of Merlin to win, but the old wizard is nowhere to be found. Beyond the mud and the blood, he’s off getting “sozzled” before convincing a robot knight from Cybertron to lend him aid. Despite the old coot (played by Stanley Tucci) tottering around and mumbling, he is given a magic staff and the assistance of a robotic dragon to help defeat the Saxons. 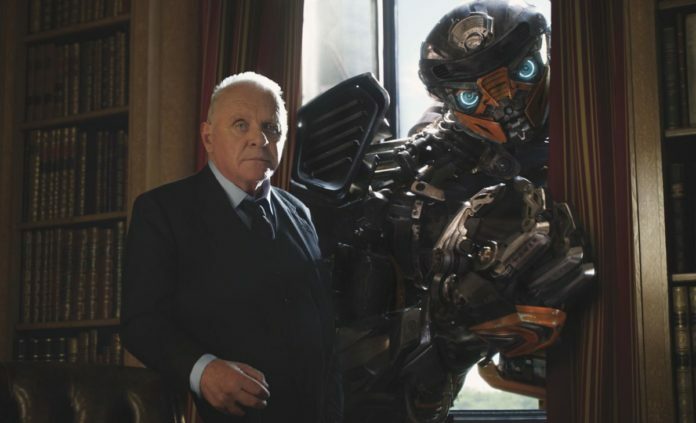 The narration by Anthony Hopkins, touting “without sacrifice there can be no victory,” is supposed to be somber and pensive, but loses all clout against the buffoonery of the previous scene. Thus is the tone of the entire two-and-a-half-hour film, a rattling clash of faux-gallantry and misplaced slapstick: a knight’s tale as told by the court jester. We see much later in the film (set 1600 years after that saucy wizard gets sauced and takes credit for Autobots saving the day) that Anthony Hopkin’s character, Sir Edmund Burton, the last of the Witwiccan Order that protect the secrets of the Autobots in the Earth, is a bit off his gourd and is cared for by the loyal but admittedly sociopathic butler Cogman (Jim Carter) and the bodyguard Bulldog (Mark Ryan) who has “robot dementia.” One man and two robots, all in dubious mental states, holed up in an English castle together for decades leads me to one conclusion: this entire film takes place within Burton’s brain as he tries to retell Monty Python and the Holy Grail to his faithful but captive audience. The more I think about it, the more I’m convinced that we are not watching the events as they happened, but rather a loose collection of scenes from science-fiction movies as varied as “Star Wars” and “The Abyss” that infiltrated Burton’s memory as he plays out the quest of the 1975 farce, creating a nightmarish Terry Gilliam dreamscape of gradually limbless Black Knights, French caricatures who have no business in England, loose political allusion as outlined by characters named Dennis, and a legendary Book of Armaments. Oh, and puns. Many puns spoken by all. If my theory is true, and Burton is imagining this whole story one long, long, long, boring, rambling afternoon, then the nonsensical plot, overblown military spectacles that look like extended commercials for U.S. Armed Forces, obvious product placement of Bud Light and car companies, and absolute bewilderment of how to handle female characters is understood: they are merely a series of explosions of synapses preceding a massive stroke. It’s as if the bookcases of the Trinity Library where the book of secrets is hidden are collapsing, one by one. In present times, Optimus Prime has left Earth to return to his destroyed home of Cybertron. Apparently, modern engineering and science has enabled humans to see the storms of Jupiter, but not detect Cybertron approaching Earth until it is close enough to destroy us in three days. The Transformer Reaction Force, or TRF, works with the U.S. military to hunt down, incarcerate, or destroy both Autobots and Decepticons, and those robots who have not been caught are forced to hide in remote areas. Cade Yeager (Mark Wahlberg) is separated from his college-age daughter and living in a junk yard with a group of Autobots, including Bumblebee (Erik Aadahl), Hound (John Goodman), and Drift (Ken Watanabe). The TRF and cohorts Lennox (Josh Duhamel) and Santos (Santiago Cabrera) want alien technology rumored to be deep in the Earth so they decide to harness Megatron (Frank Welker) and his thugs to obtain it. The Dirty Decepticons have American Gladiator-type monikers like Nitro and Berserker, and besides their freeze-frame introductions they aren’t that memorable. Bullies who join up with an alpha bad guy are inherently vanilla — no one wants the spotlight off the bride. Cade gets a tagalong in the form of Izabella (Isabela Moner), and orphaned teenager from the Chicago streets who is adept at fixing machines and escaping the clutches of both the TRF and Decepticons. She is skilled, streetwise, and tenacious: let’s devalue her qualities and leave her behind while Yeager, whose permanently wide-open eyes and mouth make him look like a sweaty Fidget Spinner, gets whisked to England! For it is Yeager who may just be the Last Knight, although there are lots of robot knights he meets along the way who have been at their jobs way longer than him and have every right to be miffed at his new title. Plus, there is the character of Viviane Wembly (Laura Haddock), who not only has the potential to be gallant and brave, but assumes the opportunity straight on before having it ripped from her by Lord Fidget Spinner or Sir Edmund “I’m Losing My Mind” Burton. The only other major female character is Quintessa (Gemma Chan), the creator of the Transformers and a literal succubus who wants to drain Earth dry by the faultiest science this side of Spaceballs. Honestly if she had transformed into a giant maid with a vacuum and sucked all the air from Earth, it would have made more sense. Since she is both creator and destroyer, she has brought misfortune upon herself. So greedy! In the first scene with Viviane, she is surrounded by older female relatives trying to force her into marriage. But I am a professor at Oxford, she argues. Pish-posh! They counter, giggling and clucking like chickens. Even more aggravating is that these women are given about as much screen time as Izabella at this point in the film. Viviane huffs off to her luxury car, which turns out to be an Autobot with a fake French accent! It carts her to Burton’s castle where she tumbles down a hill, then reappears in the drawing room completely unblemished. Burton and Cade need her help, but she soon assures them that her dad did not involve her in his work and she is therefore useless to the cause. She is, however, useful to fulfill Cade’s daughter’s wish that her father stop saving the world and get a girlfriend, which would be pretty pointless if the world goes to pot because it wasn’t saved. Wahlberg and Haddock have the chemistry of a wet wick and a broken match, but that doesn’t stop human and alien alike from trying to force them into a relationship. Because that’s all Viviane should have, even though she is the rightful bearer of the magical staff from Arthurian legend. So goes the hot-potato game of who’s got the staff for the last thirty minutes of the film, as Viviane uses a wisp of her professorial skills to find it, only to have it snatched from her at least twice. Actually described as “this girl/woman/teacher,” she is utilized by the military and government men to fulfill their aim while Yeager’s robotic armband transforms into Excalibur and enables him to assume the power of Greyskull or something. Wrong ’80s cartoon? Even in the final moments, when the battle is halted — not finished, because it is obvious there will be another film — the Autobots return to Cybertron, which is now affixed to the side of the planet like a giant carbuncle. Are they going to detach it and fly away? Because that could affect the gravitational orbit and why the heck am I even trying. Just in the flying rabbits to attack the rest of the knights.